There’s more than one way to host a celebration. One person might plan a sedate dinner party, with a carefully curated guest list. Another person might opt for a big bash where “plus ones” are welcome. Though each approach looks different, the end result is the same: a group of friends enjoying a special occasion, a convening of people around the same table. Similarly, we have found that there’s more than one way to “set the table” or begin the kind of collective-impact-inspired work that is happening in communities across the country. Many collective impact initiatives begin with establishing a leadership council of community leaders and other stakeholders. 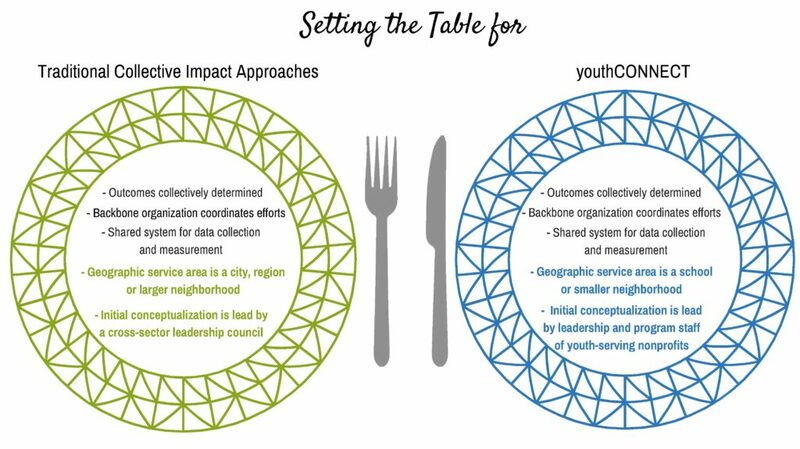 We set the youthCONNECT table differently, beginning with a small cadre of youth-serving nonprofit organizations and inviting additional stakeholders to the table as we fleshed out our goals. Our initiative to reach nearly 22,000 in Greater Washington began in 2010 with six youth-serving nonprofits and was developed in partnership with the executive directors of these organizations. As these leaders began to envision how we could work together, they brought a perspective of the region that was informed by their knowledge of on-the-ground realities facing youth. Over time, we encouraged the leadership table and structure of youthCONNECT to evolve. We partnered with Monitor Deloitte to develop our strategic plan. Then we created functional working groups, which enabled program and evaluation staff to wrestle with shared challenges and develop solutions. As the work shifted from conceptualization to implementation, we evolved once more so that the program and evaluation staff drove much of our agenda, with the executive directors serving more as a governing board. Child Trends, our evaluation partner, was with us throughout the process. Sometimes an external catalyst prompted a significant development or advanced a strategic objective. Our structure enabled us to be nimble in response to these new opportunities. For example, early on, the executive directors identified Prince George’s County, Maryland, as an area in our region where they would like to work collaboratively. So when Prince George’s County Executive Rushern Baker invited youthCONNECT to the County, we were both poised to make that pivot and able to adapt with minimal disruption. youthCONNECT at Suitland High School was born. Our experience also illustrates that the potential benefits of engaging with various sectors sequentially, rather than bringing them all to the table from the start. By beginning at the ground level, with service providers, we gave ourselves space to let youthCONNECT develop and achieve some early wins before engaging other sectors at logical junctures. youthCONNECT began with a combination of federal, philanthropic and nonprofit resources. We have since expanded our table to include local government, as well as businesses to support this youth development initiative. One benefit of this “just in time” approach to bringing new partners to the table is that we had a clearer sense of what youthCONNECT could accomplish and who would be the critical stakeholders to achieving our collective goals. We were also able to wait to engage until all parties could clearly identify and articulate the mutual benefit of working together. In doing so, we helped to create an enabling environment in which youthCONNECT could be more successful in expanding opportunities for young people. For example, it was easier to demonstrate the potential value of youthCONNECT to Prince George’s County Public Schools (PGCPS) once we had a clear sense of what the network had to offer and how we aligned with the county executive’s priorities. As a result, Suitland High School, PGCPS and the county administration are now at the table with us, co-creating youthCONNECT at Suitland High School and our newest initiative, Ready for Work. Launching collective impact efforts is no different. Sometimes, it makes sense to begin by convening a large, multi-sector leadership body. For youthCONNECT, beginning with a small group of service providers then strategically inviting new partners enabled us to be more responsive to the changing landscape and to align our engagement with new collaborators to when we could make a clear case for a win-win partnership. The current phase of our youthCONNECT “party” at Suitland High School has notched several successes, including serving more than 700 students in our first year. Going forward, we are excited to set new tables at Oxon Hill High School and High Point High School as we expand youthCONNECT to these County schools through Ready for Work.